How do I log on to my account and access the newsletters? 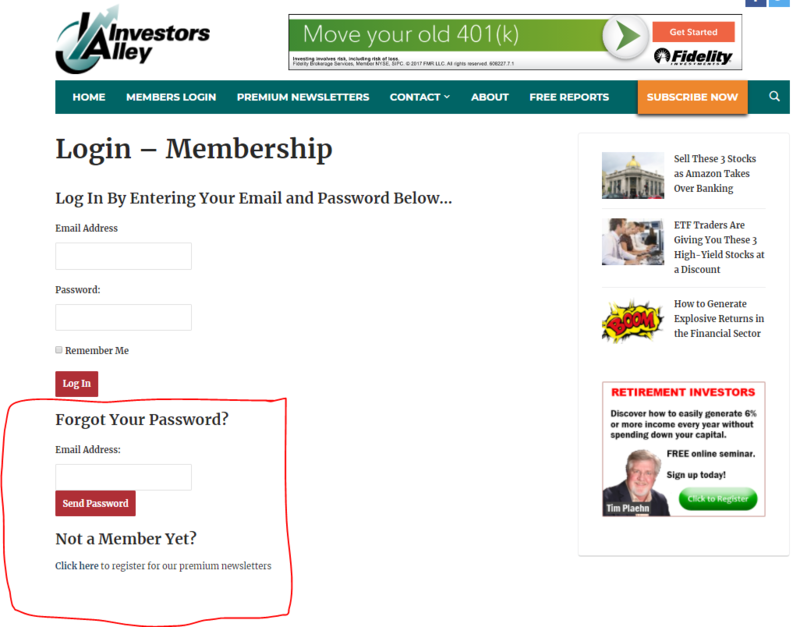 To access the members-only website and your paid subscription newsletters, you must be logged onto www.investorsalley.com. 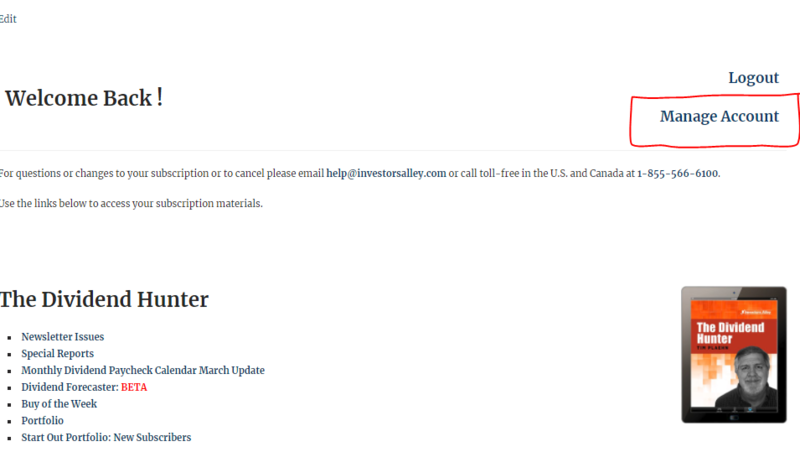 To access the login page from anywhere on our website, look for the “Investors Alley” logo on the top left of the page. Just below that you will see the “Member Login” button. Click that button, and it will take you to either the login page, or the main page if you are already logged in. On the login page, enter your email address and password. Once you’re logged in, you’ll immediately be taken to your main page. Once on your accounts main page you will be able to access all of your newsletters content via the links underneath that particular newsletters name. In the example below we have The Dividend Hunter. First you will notice a welcome back notification to you that you have successfully logged into your account. Below this is a brief assistance reminder should you need to contact our customer service department. Below this is The Dividend Hunter and it’s related content. By clicking on each link underneath The Dividend Hunter’s title you will be taken to a web page in which you can interact with the content for that particular aspect of the newsletter. Retrieving your password is easy, no worries. Simply go to the “Members Login” page where you will find the forgot your password feature of our website. Please put in your email address and your password will be sent to you momentarily. Should you find that a password has not been sent to your email inbox please email our customer service department at help@investorsalley.com and ask a representative for your accounts password. Our staff will send you your password upon immediate receipt of your request. You can change your password through navigating to your “Main Page” of the “Member Login” section. Once at the main page, on the right hand side, you will see a button titled “Manage Account”. Once you click on “Manage Account” simply click on “Change Your Password” and you will be able to change your password on the following page. My email has changed, where can I update my information? To change your email address please email our customer service department at help@investorsalley.com and a representative will perform this function on your account. **Note** once you change your email, the new email address will be used to log in. You can change your credit card on file by navigating to the Main Page of the “Member Login” section. Once at the main page, on the right hand side, you will see the button titled “Manage Account”. Please click this button and follow the prompts on the next page to update your information. Below you may see which link to click once you have clicked “Manage Account” from your accounts Main Page. Or, you may call our toll free number 1-855-566-6100 between 9:30 and 4:30 eastern Monday to Friday and out customer service department will update your information for you. All subscriptions will automatically renew at the end of your subscription term, in most cases one year. Two weeks before your subscription renewal, we’ll send you a renewal notification by email. If you do not want your subscription to be automatically renewed, you can contact us at help@investorsalley.com or by phone at 1-855-566-6100 from 9:30 – 4:30 eastern Monday to Friday, and we would be glad to assist you. This toll-free number will only work for American and Canadian subscribers. If you do not reside in either of those countries please email us at help@investorsalley.com. All of our subscriptions are backed with a 60 day full money back guarantee. If you don’t want to keep your subscription for any reason during that time email us at help@investorsalley.com or call us at 1-855-566-6100 from 9:30 – 4:30 eastern Monday to Friday, and we’ll issue a full 100% refund of the amount you paid if your subscription is cancelled within your first 60 days. This toll-free number will only work for American and Canadian subscribers. If you do not reside in either of those countries please email us at help@investorsalley.com. It is important to note that a refund is only available for a newsletter one time. If you receive a refund for a particular newsletter, our policy states no future refunds will be issued for that newsletter at any point should you resubscribe. If you wish to cancel after the 60 day trial period, we will give you a pro-rated refund based on how many months you have kept your subscription. To cancel, email us at help@investorsalley.com or call us at 1-855-566-6100 from 9:30 – 4:30 EST Monday to Friday. We will be happy to assist you. This toll-free number will only work for American and Canadian subscribers. If you do not reside in either of those countries please email us at help@investorsalley.com. I don’t recognize a charge on my credit card from Investors Alley, where can I find out more information on what the charge is? If you came here looking for answers about charges on your credit card, we have FAQs set up answering all the questions frequently asked about how our products are billed on your credit card. The links below are for each of our products. What should I expect as soon as I sign up? As soon as you sign up you will receive a welcome email from Investors Alley. Inside of the email there will be links to the latest issue of the letter as well the current special reports. When do you publish your newsletters? Newsletters are published once a month, with updates sent out in between when needed. Biotech Gems, Automatic Income Machine and 30 Day Dividends publish mid-month while The Dividend Hunter and Growth Stock Advisor publish at the beginning of the month. Additionally, some publications have weekly updates. Will the newsletters be mailed to me? We send out our newsletters exclusively through email. You will receive our newsletters to the address that we have on record. Also, all of our newsletter issues are available online on our website after logging in. The newsletters are emailed as direct links and do not require you to login. However, you do need a program on your computer that can read PDF files, such as Adobe Acrobat. If you do not have a program such as Adobe Acrobat, you can download it Here for Windows or Here for Mac. Our editors make an effort to be there for subscribers who have questions, and they can be contacted through email. Please send all questions for our editors to help@investorsalley.com and our customer service staff will ensure prompt distribution to our editorial staff. They can answer questions about the stocks in each of their respective portfolios and their strategies, but they cannot answer any questions about your personal portfolio or give investing advice or provide opinions on securities that are not in their respective portfolios. Any questions about your subscription (terms, renewal date, credit card, etc.) should be directed to our customer service department via email help@investorsalley.com or by phone 1-855-566-6100 9:30 – 4:30 eastern Monday to Friday. Does Investors Alley invest on my behalf? Do I send my money to Investors Alley to buy the stocks recommended? Investors Alley Corp. is an investment research firm that publishes information about the stock market and investing through our free e-letter “The Market Cap” which is published every Monday and Wednesday and through our paid subscription newsletters that are published monthly. We are not a stock broker and do not handle any client funds for investing. I did not receive my “Buy of the Week” email from The Dividend Hunter this week, what happened? 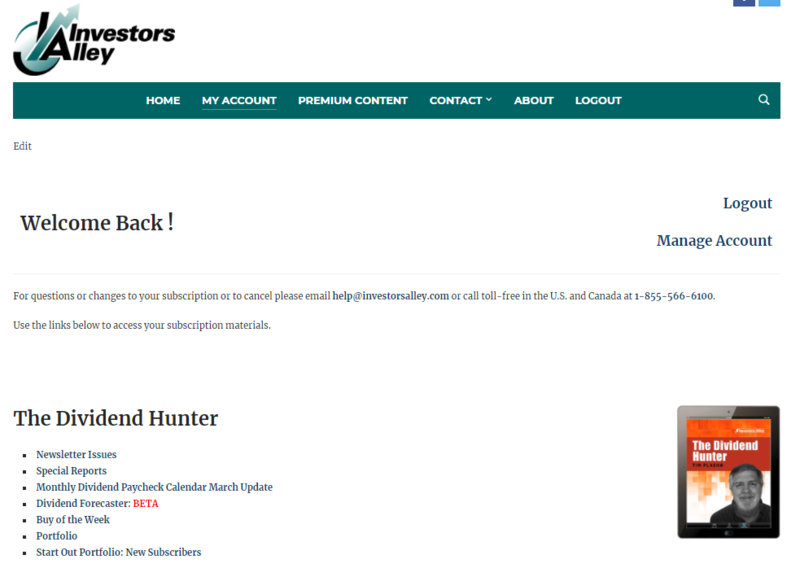 The Dividend Hunter’s “Buy of the Week” email will be sent out every Tuesday except for the weeks where we are publishing the latest issue of the newsletter. So, if you didn’t receive your “Buy of the Week” email, be on the lookout for the latest issue of the newsletter.